Manufactured in the United States, Meet Greenbox, the first fully automated cannabis kiosk. From the moment we step out the door, our daily lives are simplified by the wonders of modern-day automation. Whether it’s pre-ordering your Starbucks on your phone, printing your plane ticket at an airport kiosk, or simply ordering your groceries online, automation is the grease that keeps this high-paced world spinning. So why should buying your cannabis and CBD be any different? Greenbox Robotics has harnessed the most sophisticated automation technology to make your buying and selling experience fast, easy, and way ahead of its time. Essentially, Greenbox is an interactive touch-screen operated vending machine designed to make medical marijuana purchase experience both easy and efficient. Greenbox will recognize you as a new or returning customer creating an experience tailored to you. I wanted to find out more about how Greenbox Robotics is bringing automation to the cannabis market and the tech behind the self-serve kiosks that dispense cannabis. 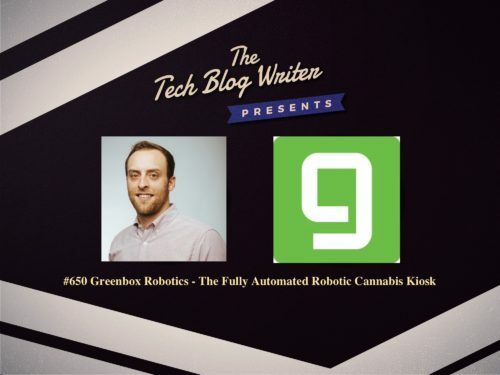 Greenbox Robotics Founder & CEO Zack Johnson joins me on my daily tech podcast to share his story and how technology is transforming the cannabis industry. I learn how tech is enabling users to select products via a touchscreen and a robotic arm grabs the selected product. Zach reveals more about how an app provides an up-to-date menu of products in the kiosk for shoppers before entering a dispensary. We also discuss how the machines and app also use biometric facial recognition technology to verify customers. Zack studied International Relations with a minor in Marketing at the University of Massachusetts in Amherst. In 2010, while still in college, Zack launched his first company, a record label. Six months after launching 1st Round Records, Johnson debut artist had the #1 album in the US &amp; Australia. Zack had his first exit to Sony RCA in 2014. After transitioning out the music business, Zack launched an athletic apparel company that focused on innovative textiles. Zack negotiated a partnership to make energyDNA the official apparel partner of the FIA Formula E Championship racing series. Prior to launching Greenbox Robotics, Zack was the Director of Strategy and Business Development at the fastest growing marketing firm in the United States, Hawke Media. While in the Hawke’s nest Zack was the Chief Marketing Officer for five Los Angeles cannabis dispensaries, as well as a metal fabrication company that builds vending machines. The biggest pain point for each dispensary was not being able to service customers fast enough. This pain point and the relationship with the metal fabrication company was the inspiration for Greenbox. Follow Greenbox Facebook and Twitter.